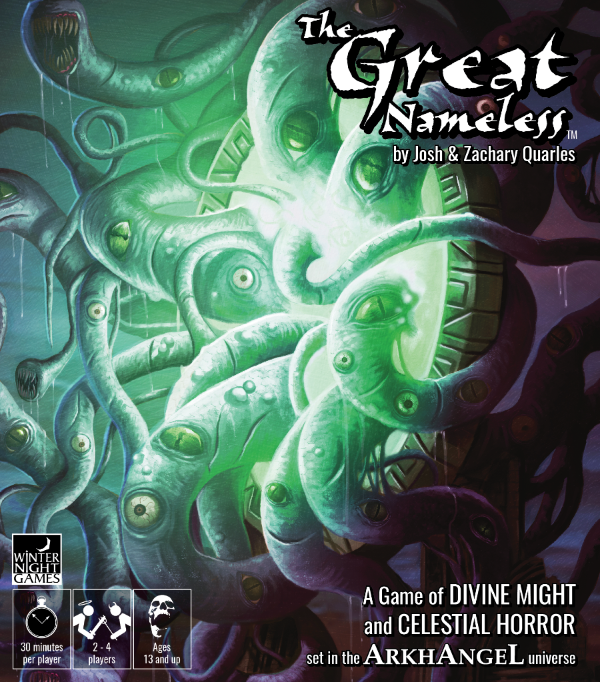 The Great Nameless Kickstarter Announcement!! Four Gods. Four Realms. One Endless Engine of Destruction. The Great Nameless is now on Kickstarter! Each god features its own deck of cards, playstyle and backstory. Each player represents a god who will build armies, equip them with artifacts, and manipulate events in order to strengthen their position on the board. Players will work to Seal their Realms away from invasion by the armies of their mindless, all-powerful creator, Z'xhuul. Or they may instead sabotage each other in the hopes that their opponents will be too weak to withstand the onslaught of Z'xhuul's avatar, The Great Nameless. Check out our Kickstarter campaign for full details on components and gameplay, backstory and the upgrades we have planned for stretch goals. You can even watch gameplay videos and download the full rules! contribute to The Great Nameless Kickstarter now! Arkhangel: The House of the Seven Stars is 50% off! Arkhangel: The House of the Seven Stars is 50% off for a limited time at Steam and itch.io! Truly the most wonderful time of the year! Our crowdfunding campaign has a date! After several long years of development, attending cons and just trying to put this in front of as many people as possible, we’ve decided it’s time to pull the trigger on going to Kickstarter with The Great Nameless. Now that Arkhangel is out in the world, we wanted to get the companion piece out there as well! It’s been a long time coming, but assigning a date makes everything seem so much more real! Winter Night Games will be at BGGCon! The holidays are almost upon us! Besides watching horror movies all throughout October, buying elastic-waisted pants for November, shipping a massive update to our original point & click adventure game, Arkhangel: The House of the Seven Stars, and already dreading Christmas shopping, it's *also* been a pretty busy time for our table top game, The Great Nameless! We attended RinCon in Tucson at the end of September, Archon in St Louis in mid-October, and this weekend we hit BGGCon in Dallas, TX! So if you were at the either of the first two cons, it was very nice to meet you! If you are at BGGCon, come and say hi! We'll be wandering the hall Friday and we'll be at the Indy Booth Saturday afternoon, and we'd be happy to demo the game for you, or just give you a fist bump. Looking forward to 48 straight hours of gaming! ARKHANGEL VERSION 1.2 AVAILABLE NOW AT 33% OFF FOR A LIMITED TIME! We are very excited to announce that the long-overdue update for Arkhangel is now available with a limited time special promotion sale at 33% off list price! So, what all is included with this update? Let's get to it, shall we? + Added full game controller support. This was a full replacement of the Unity Input System! Yowza! + Significant overhaul to Player navigation settings and speed. + Added a "Run" option to allow the player to explore at a faster rate. + Restructured menus to allow for easier controller navigation. + Inventory has been significantly overhauled. It is now opened/closed by an input key rather than a mouse over. Interaction methodology and presentation has also changed. This has had cascading effects on multiple other systems that required adjustments. + Visual Quality settings, Screen Resolution settings, and Controller Customization are now all handled with in-game menu interactions. + Updated multiple camera transitions in the game to be fades rather than movement based. + Updated camera positions and control perspective in the Library and Saloon. + A ton of small tweaks and adjustments! + Use previous saved games at your own risk! With the sheer amount of changes to the underlying systems of Arkhangel, we cannot 100% guarantee that loading into old save games before this update will be completely reliable. By all means, give it a shot, but know that there very well could be significant issues with player animation, controls, and menus. + We recommend using D-PAD when navigating through menus with a game controller. This update took significantly longer than we expected. Being the only Unity developer on our team, I (Zack) vastly underestimated the number of hurdles and cascading effects that such an update was going to introduce. That being said, we've had a lot of great feedback on this update. Friend of Winter Night Games and game industry veteran, James Goddard gave us some incredibly valuable advice regarding player speed, animation settings, and controller feel. When the guy that worked on Street Fighter II gives pointers, you LISTEN! As always, continue to give us feedback. Your thoughts and insights have been incredibly valuable and are the main reason why we pushed so hard on this update. We knew that the controls needed some love and your guidance made us really want to focus on it with a microscope! Y'all help us grow! Inspired by the classic point & click adventure games of yesteryear, Arkhangel: The House of the Seven Stars is a story told through the eyes of a family that has recently moved to an isolated town in the frozen wilderness. Explore, unearth dark mysteries, solve puzzles, engross yourself with deep lore, and interact with a large cast of characters in this rich and layered narrative beautifully underscored by a thematic and emotional musical soundtrack by composer and conductor Chad Seiter (ReCore, Super Lucky's Tale, Star Trek, FRINGE, Lego Jurassic World, The Legend of Zelda: Symphony of the Goddesses). PC - Windows 10 (Windows 7 SP1+ compatible but unsupported); i3 Core @ 2.9 GHz; 4 GB RAM; Graphics card with DX10 (shader model 4.0) capabilities; 5.2 GB available space. Mac – macOS Sierra; 3.4 GHz Intel Core i7; 8 GB RAM; 5 GB available space. Winter Night Games is an American independent gaming company founded by two weird brothers, Josh and Zachary Quarles, focusing on horror and narrative driven experiences.